Want to know how to draw feet on tiptoes? And why not? It’s a great way to practice your understanding of the bones in the foot while still being a very useful pose for drawing all kinds of characters – not just for females. 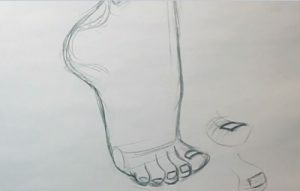 The first thing to remember when learning how to draw feet on tiptoes is that the arch becomes very exaggerated as the weight is transferred to the toes. With all this weight on the toes you will want to make sure they are sticking out an appropriate amount. Unless you’re drawing a ballerina, most people don’t stand on the actual tip of their toes. It is also important to keep in mind the “bump” on the top of the foot (called the instep). It becomes more pronounced in the tip toe position as well. 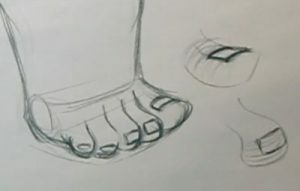 When you are studying how to draw feet on tiptoes, keep the structure of the foot in mind. The toes are the front of the cheese wedge and they are an independent piece of the sketch. The big toe is the anchor and will do a lot of the work in maintaining the balance of the character. Once you have drawn the toes coming out from the knuckles you can add toe nails to give the viewer a better understanding of how they are looking at the foot. In this example, notice the big toe nail is drawn to indicate that it is flat on the floor, while the other four toe nails are facing us, letting the viewer know that these toes don’t have as much weight on them as the big toe. Depending on the nature of your drawing and what sort of feel you are going for you may not want to include toe nails. If you are drawing something a little more cartoony, it might look weird to have realistically drawn toe nails. It’s up to you – you will know whether something looks right or not when you are finished. That’s it for our article on how to draw feet on tiptoes. We hope you enjoyed it! Step by Step Drawing isn’t dead? So now what? ?